With Halloween just around the corner, I’ve done another cute (and did I mention free) tutorial for you to have fun with this fall! 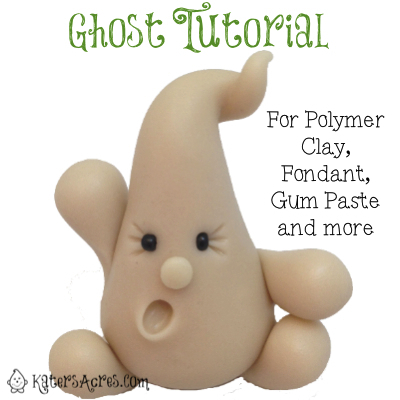 Polymer Clay DIY Craft Ghost Tutorial for Sculpture by KatersAcres http://t.co/1rjqPcL5IN Perfect for a Halloween project! Come & get it! In order to make a ghost from polymer clay, follow these steps as a guideline and use your own creativity to come up with different variations of the same styled ghost. Roll clay into a ball about the size of a walnut. Sculpt that ball into a teardrop with a really pointy top. Gently bend & twist the pointy top into a curly “ghost like” swoosh! Add arms and some legs, making sure to blend the seams together. Add a nose and use little black seed beads for a eyes. Using a ball tool, add a ghost like mouth. If you choose, add some “cheeks” using one of your chalks. Note: Keep in mind that wherever you add chalk, there will be a “dark spot” there when your ghost “glows” at night due to the opaque obstruction caused by the chalk. Depending on the type of clay used (premo, sculpey, cernit): bake in the oven at 265 degrees, covered in foil, for approximately 45-60 minutes.